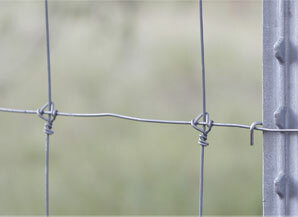 There are two high-quality fixed knot fence options suitable for virtually any application on the farm or ranch. The 50-Year Fence and Solidlock products are both manufactured in the United States by Bekaert and are available in a variety of sizes and configurations. 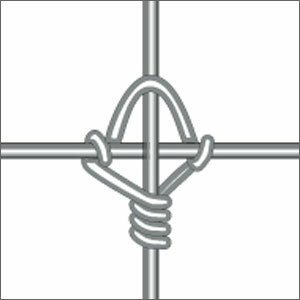 The two products are identical in their fixed knot design. These products are considered top-of-the-line as the fixed knot utilizes a separate piece of wire tightly wrapped around the line wire and stay wire, increasing the fence’s vertical strength allowing for increased post spacing and making it very resistant to animal damage. The 50-Year Fence by StaTite50 is the first and only fixed knot fence of its kind on the market today and it is backed by a 50-year warranty. Solidlock by Bekaert is a fixed knot fence design with high tensile, 12.5 gauge wire making it one of the strongest woven wire fences on the market today. The fixed knot design is considered top of the line when compared to the makeup of other wires making The 50-Year Fence the strongest, longest-lasting wire product available on the market.